Dr Matthew Malek, a Research Associate from Imperial College London, came to talk to us about "Ultra-High Energy Cosmic Rays" which are particles that still present a puzzle to astrophysicists. These rare particles have energies that scientists just cannot explain and one cosmic ray event has even been nicknamed the "Oh-my-God particle" as its observation came as such a shock to researchers. The "OMG" particle was observed one evening in November 1991 by an experiment called "Fly's Eye" in the Utah Desert. It is thought that a single proton with an energy equivalent to that of a baseball travelling at 55mph crashed into some atmospheric molecules eliciting a bright blue flash of light. This fluorescent spark revealed a cosmic ray with an energy of over 3 x 1020 electron Volts (i.e. 3 followed by 20 zeroes eV) travelling just under the speed of light! The reason that this result was such a shock was that three scientists (Greisen–Zatsepin–Kuzmin) had proposed that there should not be any cosmic rays with energies above a certain "GZK limit". Above this threshold they theorized that energetic rays would interact with the cosmic microwave background radiation and slow down as their energy went into producing new particles. Cosmic rays are usually protons but a small proportion are Helium nuclei (2 protons and 2 neutrons), which are often referred to as alpha particles. These rays were first detected by the Austrian physicist Victor Hess in 1912 when he went up in a balloon to around 17,000 feet. He found that radiation increased with altitude much to the surprise of his contemporaries and this discovery earned him the joint Nobel Prize in Physics in 1936. Low energy cosmic rays are relatively numerous compared to their higher energy counterparts, as only about 20 of the high-energy type have been seen over the past 40 years. What makes it harder to see them is that detectors such as the Fly's Eye can only observe the ephemeral blue flashes on clear moonless nights. To try and capture more of these events a different type of detector has been built called a "surface detector". 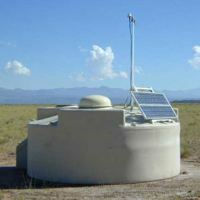 Unlike the Fly's Eye detector, which used mirrors and photomultiplier tubes to detect cosmic ray collisions, the surface detectors use tanks of pure water to reveal the collisions. When a high energy particle collides with a water molecule a flash of blue light known as Cherenkov radiation is emitted. This method of recording the cosmic rays means that in theory they can work all the time and not just on clear nights with no Moon. The Pierre Auger Observatory uses a combination of both optical and surface detectors to try and record ultra-high-energy cosmic rays. It is situated in a remote region of the Argentinian Andes and its detectors are spread over an area of 3,000 km. In the future there are plans to base cosmic ray detectors on the International Space Station which will look back onto wide swathes of the Earth's surface and hence record many more of these rare cosmic ray showers.